Brief Synopsis: Bat-Mite tries to help Robin against Gridlock. PRODUCT PLACEMENT: Booster has survived Convergence and is back in the endorsement business! Introducing Booster Puffs Cereal, the fourth cereal endorsed by our hero. 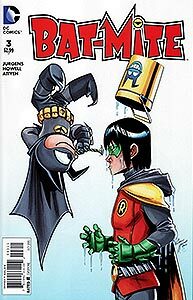 Boosterrific Review: I'm no fan of Damian Wayne, so I enjoyed seeing him ridiculed by Bat-Mite, who really does seem like a relic from a different, less serious time.